Rich Mercier was born in Montreal, Quebec, Canada and placed 5th in the Canadian Junior Freestyle Mogul Championships in 1993. Coming from the cold North, Mercier quickly became accustomed to the stifling South Florida heat and would become one of the Hurricanes most dependable offensive lineman in its history. Ranked the #2 college recruit out of Canada, he came from Montreal’s Vernier College (high school) to help anchor UM Sports Hall of Fame member Art Kehoe’s offensive line. 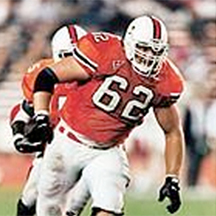 Rich led the Canes line in pancake blocks during both his junior and senior seasons and would go on to tie UM Sports Hall of Fame member Mike Sullivan’s school record for career starts with 48. He was named a 1999 All American First Team member by The Sporting News and Pro Football Weekly and was a two time All BIG EAST First Team selection, in 1998 and 1999. In 1998, he was the recipient of the Walter Kichefski Endowed Scholarship, presented by the UM Sports Hall of Fame. For his efforts in the 1998 Micron PC Bowl, he was named to Sports Illustrated’s All Bowl team. He was invited to play in the Senior Bowl, the Hula Bowl, the East-West Shrine game and the Florida Citrus All Star Gridiron Classic after his senior season. Mercier was a 5th round pick by the Baltimore Ravens in the 2000 NFL draft and was in the NFL for 3 seasons. Draft reports praised Mercier’s initial movement and ability to block while retreating in pass protection, and described him as a disciplined blocker with great lower body strength. Mercier was one of the strongest players on the Miami Hurricanes squad. He fondly remembers Miami’s upset of then #2 UCLA Bruins in the Orange Bowl in 1998 as one of his best times with the Hurricanes. Rich graduated from UM with a double major in Accounting and Finance, with a minor in International Business. He is married to Yadi Vasquez and they have a daughter, Sophia Rose Mercier, and they live in Miami.